my 64GB Lexar 1066X tested in 5D3 benchmark speed up to 121MB/s write. You will find a file BENCHx.PPM on card root. Convert it to PNG or JPEG, upload it somewhere and link it here, please. I've ordered komputerbay 64gb 1066x cf card from amazon. I want to use with sd card for the best quality. Is there a scheme or tutorial to show how should the settings be? and achieved speeds around 56 MB/s in the 2.5k preset. In the cardreader Transcend TS-RDF8K I've run the blackmagic diskspeed test which were 75MB/s Write And 79MB/s Read, and used also the F3X soft to test the Card, which test it passed, however the sustained writespeed was around 72 MB/sec. Even this card doesn't perform as advertised, I think I will keep it. 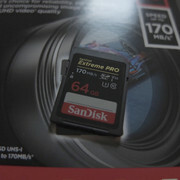 170 MByte/s mode is proprietary SanDisk. SanDisk doesn't keep it a secret this mode is available using some of their own cardreaders only. And it is read rate. They are a tad slower in write mode compared to fastest "conventional" cards supporting UHS104 mode only (when used in devices following SD Association specs). F3X isn't build for speed and will not tell you card's top performance.